A month ago, I wrote at length about my list-making evolution, starting with Arnold Lobel’s marvelous children’s book character Toad and ending with my discovery of The Omni Group‘s organizational programs for the Mac, OmniFocus and OmniOutliner. In the weeks since, I have continued to work daily with both Omni programs and learned a lot — about the programs themselves and, I dare say, about myself. Plus, I’ve had a lot of fun reading the comments on the OmniGroup-moderated OmniFocus forums. The passion people have for this program is quite astonishing. You wouldn’t believe how desperately people have been waiting for the release of the iPad version of OmniFocus, a desperation I have come to understand, if not share. But I’m not here to tell you about the surprising complexities of OmniFocus, and the questions it raises about how to live a life. 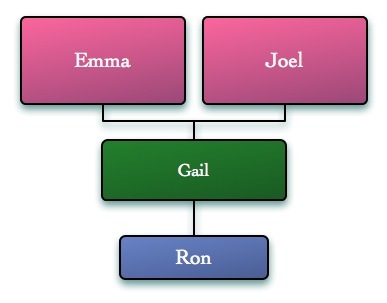 Rather, I just want to say a few words about a third Omni Group program, OmniGraffle. Given my new-found admiration for Omni Group, I spent some time last month reviewing their other programs — OmniGraffle, OmniGraphSketcher, and OmniPlan — in order to determine if I had any use for them. Omni Group lets you download any of their programs for the Mac desktop for a 14-day trial before you have to pay for it. I’ve been sufficiently busy that I knew I wouldn’t have much time to try them out, but OmniGraffle looked so cool that I couldn’t resist. I downloaded it three weeks ago and immediately began playing with it. The problem was, I really did have no use for it. One thing it does is make organizational charts. 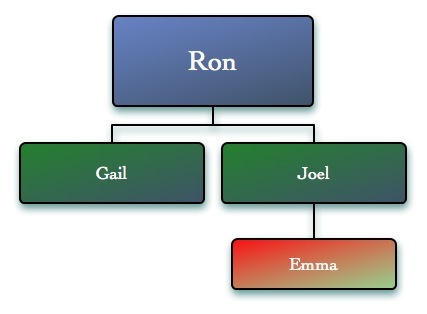 I decided I would make a chart of our family organization. At first I did so manually, creating boxes, putting names in them, connecting them. Then I realized this was dumb. I wasn’t taking advantage of OmniGraffle’s power. One can simply make a text outline — outlines being OmniGroup’s specialty — and OmniGraffle will chart it automatically. One can then customize the chart, in terms of shapes or colors or sizes, or apply styles used before. The result, below, may align more closely with reality. What next? I don’t know. Truth is, I haven’t used OmniGraffle since. I wish I had a need for it, but I don’t. I’m tempted to buy the iPad version (no free trials there) so that I could play with a sophisticated program that makes good use of its capabilities. Maybe I will one day. For now, I content myself with pining for OmniFocus on the iPad. It’s gonna be great.